alaTest has collected and analyzed 7 reviews of Illy Y1.1 Touch. The average rating for this product is 3.2/5, compared to an average rating of 4.4/5 for other products in the same category for all reviews. Reviewers really like the design. The usability is also appreciated. We analyzed user and expert ratings, product age and more factors. Compared to other products in the same category the Illy Y1.1 Touch is awarded an overall alaScore™ of 85/100 = Very good quality. 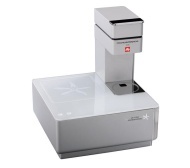 The illy Francis Francis Y1 won't lure Espresso connoisseurs, but it makes a decent brew. If you just want espresso and don’t mind using pods, the illy Francis Francis Y1 is a good pick. But if you want to twek your brew, make milk drinks or get hot water, it ain’t gonna happen.